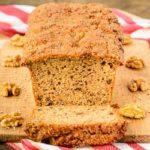 Maple Walnut Quinoa Quick Bread is made with both toasted quinoa and quinoa flour. It is lightly sweetened with maple syrup and loaded with walnuts. Preheat oven to 350°F. Lightly grease an 8- X 4-inch loaf pan (heavy aluminum loaf pan recommended). Toast the quinoa in a dry skillet over medium-high heat until it is lightly golden in color and just begins to pop. Transfer to a plate and cool to room temperature. Whisk together toasted quinoa, quinoa flour, walnuts, cornstarch, baking powder, baking soda, and salt in a large bowl. Whisk together eggs, yogurt, oil, and syrup in a medium bowl until combined. Pour wet ingredients into dry ingredients and stir until just combined. Spread batter evenly in prepared loaf pan. Sprinkle sugar on top. Bake for 45 to 50 minutes or until top is lightly browned and a toothpick or cake tester inserted in the center comes out clean. Cool in the pan on a wire rack for 5 minutes. Remove bread from pan and cool completely on a wire rack. You may need to use a knife to loosen the edges of the bread from the pan due to the sugar causing it to stick.